This book describes a full range of contemporary techniques for the design of transmitters and receivers for communications systems operating in the range from 1 through to 300 GHz. In this frequency range there is a wide range of technologies that need to be employed, with silicon ICs at the core but, compared with other electronics systems, a much greater use of more specialist devices and components for high performance – for example, high Q-factor/low loss and good power efficiency. 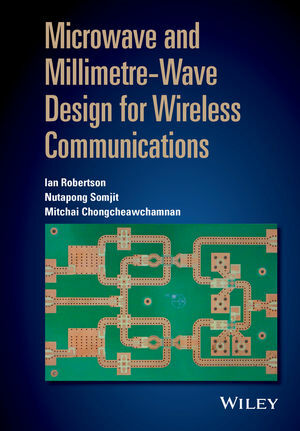 Many text books do, of course, cover these topics but what makes this book timely is the rapid adoption of millimetre-waves (frequencies from 30 to 300 GHz) for a wide range of consumer applications such as wireless high definition TV, “5G” Gigabit mobile internet systems and automotive radars. It has taken many years to develop low-cost technologies for suitable transmitters and receivers, so previously these frequencies have been employed only in expensive military and space applications. The book will cover these modern technologies, with the follow topics covered; transmitters and receivers, lumped element filters, tranmission lines and S-parameters, RF MEMS, RFICs and MMICs, and many others. In addition, the book includes extensive line diagrams to illustrate circuit diagrams and block diagrams of systems, including diagrams and photographs showing how circuits are implemented practically. Furthermore, case studies are also included to explain the salient features of a range of important wireless communications systems. The book is accompanied with suitable design examples and exercises based on the Advanced Design System – the industry leading CAD tool for wireless design. More importantly, the authors have been working with Keysight Technologies on a learning & teaching initiative which is designed to promote access to industry-standard EDA tools such as ADS. Through its University Educational Support Program, Keysight offers students the opportunity to request a student license, backed up with extensive classroom materials and support resources. This culminates with students having the chance to demonstrate their RF/MW design and measurement expertise through the Keysight RF & Microwave Industry-Ready Student Certification Program. Ian Robertson (FIEEE 2012) received his BSc (Eng.) and PhD degrees from King's College London in 1984 and 1990, respectively. From 1984 to 1986 he worked in the MMIC Research Group at Plessey Research (Caswell). After that he returned to King's College London, initially as a Research Assistant and then as a Lecturer, leading the MMIC Research Team, and finally becoming Reader in 1994. In 1998 he was appointed Professor of Microwave Subsystems Engineering at the University of Surrey, where he established the Microwave Systems Research Group and was a founder member of the Advanced Technology Institute. In June 2004 he was appointed to the University of Leeds Centenary Chair in Microwave and Millimetre-Wave Circuits and he is now Head of the School of Electronic & Electrical Engineering. Nutapong Somjit?received the Dipl.-Ing. (M.Sc.) from Dresden University of Technology, Dresden, Germany, in 2005, and the PhD from KTH Royal Institute of Technology, Stockholm, Sweden, in 2012, all in electrical engineering. Since August 2012, he has been with the Chair for Circuit Design and Network Theory, Dresden University of Technology, where he leads a research team in microsensors and MEMS ICs. He is currently a lecturer (assistant professor) in the School of Electronic and Electrical Engineering, University of Leeds, United Kingdom. Mitchai Chongcheawchamnan was born in Bangkok, Thailand. He received the B.Eng. degree in telecommunication from King Mongkut's Institute of Technology Ladkrabang, Bangkok, in 1992, the M.Sc. degree in communication and signal processing from Imperial College, London, U.K., in 1995, and the Ph.D. degree in electrical engineering from the University of Surrey, Guildford, U.K., in 2001. He joined the Mahanakorn University of Technology, Bangkok, in 1992, as a Lecturer. In 2008, he joined the Faculty of Engineering, Prince of Songkla University, Songkhla, Thailand, as an Associate Professor.